The word' sustainable' is the new buzz word. we had green and organic now we have sustainable. What sustainable materials are there for clothing and fashion and how easy are they to come by. Linen is available in several colours from beige to grey but white linen has invariably been bleached. It does not go in a tumble dryer but needs to be dried and then ironed while still damp. Linen is virtually lint free, non allergenic and gives UV protection. Linen is durable, strong and although a bit stiff at the beginning, washing improves it to get softer as it ages. According to some studies a person wearing linen perspires less than someone wearing cotton. Linen yarn is currently being produced as 100% linen yarn or 50% linen/50% cotton by a variety of companies such as Rowan or Patons for knitting and crochet and many patterns are available to make tops. 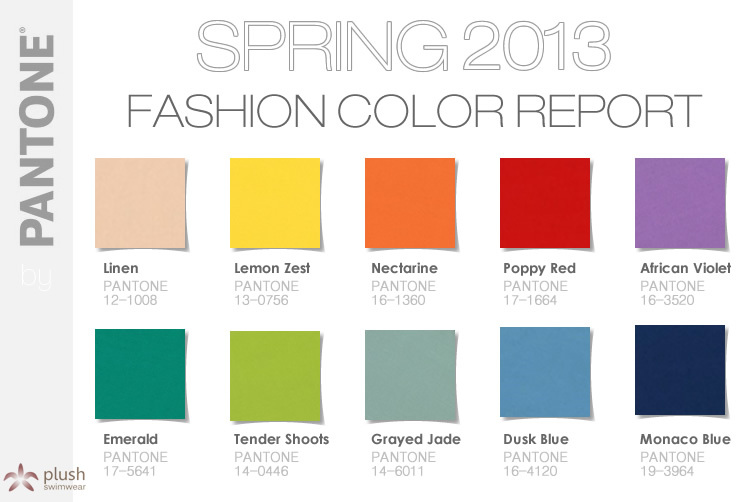 It is becoming a popular fibre choice for spring and summer. Linen clothes can be bought direct from a few designers including Terry Macey and Anjelika Elsebach in Somerset but if you are looking to make your own clothes and learn the skills necessary to make your own clothes, then fabric is widely available. Personally I now have the pattern for my linen trousers to make them in February 2013 and if succesful and they fit (?) I will add them to my sustainable wardrobe. In part 3 we will explore Hemp. The washing powders currently used and conditioners and our habit of washing, showering etc wear clothes out , creating holes, tears and generally wearing them out as quickly as possible. If you look at the make up of the resources used for your clothing you will find that 100% cotton garments have a reduced amount of cotton now and jumpers for sale are in fact no longer made of 100% wool in general but contain either cotton or acrylic. That explains why when the temperature dips and we reach for a sweater we can still be cold. We have grown from a perspective of choosing our clothes for durability, warmth and quality to other criteria such as fashion, ease of washing, colour etc. To effect a change the first change we can make is one of attitude and being more choosy in the way we look at garments. Most people had the skills to either make, mend or amend their clothes thus fewer clothes were necessary in their working wardrobe and every inch of painstakingly produced fabric was used, repaired and reused. What however are the real costs associated with these items. The result is that you will only go through a certain number of handknitted socks per year compared to cotton/acrylic ones, will have fewer going through the wash, resulting in a greater appreciation of material and skill. For years we have avoided clothes with a 'dry cleaning only' label. Not only because of the costs associated with this item of clothing and the savings that could be made but the idea of having them washed in silicone and the impact of residual chemicals that would interact with our skins and own body chemistry was unknown. You buy a suit that you have drycleaned every month at a cost of £20 each time and the suit ends up costing an additional £240 per year to maintain. The sustainable wardrobe therefore contains no items that require dry cleaning only. How many did you find.? What attracted you to this item of clothing? 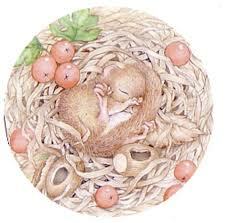 Hibernation is used by many animals to last the winter. They curl up in as safe a place as possible to keep warm surrounded by their possessions and enough food to make it until Spring. 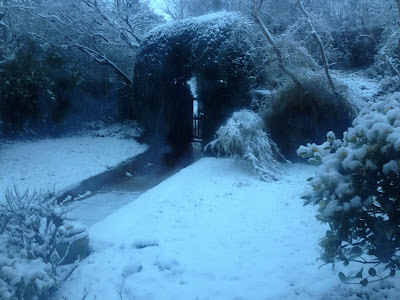 Here at the cottage the snow has been falling lightly sprinkling the garden with what looks like icing sugar and the birds have been strangely quiet. Birdfeeders get filled so we can enjoy the songs and calls of wildlife around us. The snow makes going out quite difficult but allows us also to go inward and spend some time in quiet contemplation of our inner landscape. It always amazes me that when the weather gets colder we want warming, comforting food, soups and hot drinks, a warming fire, a good book and great company. A simple life does afford those comforts but I am also aware of the many people struggling to get to work, congestion on the road, accidents and foremost the stress of battling the elements in an effort to go to work, to be that teacher or to get to whichever destination we feel compelled to get to. Many schools close their doors resulting in grandparents being on duty, or else having to take a day off work and the world as we know it slows down. It could be seen as an inconvenience. It might give us an opportunity to tune into our inner intuition and help us realise the level of stress we endure on a daily basis and how we cope with that level of stress. Snow gives us the opportunity to change our view from external to internal and revisit the goals we have set this year and how we can best achieve them with the resources we have. From, want to stuff and clutter. Can I donate it to someone who needs it or wants it? ( Clothes, books etc) Ask first. Has it any value to sell it on? Can I freecycle it or take to one of the local swap parties? Can any parts of it be repurposed? Is it mine to declutter? The questions can be endless and the right time to be asking them is when we acquire the item unfortunately, not when we no longer see a use for it. Believe me when I say at some stage it was a thing to behold. Our tastes change, our circumstances change so it makes sense to change our clutter and stuff too. 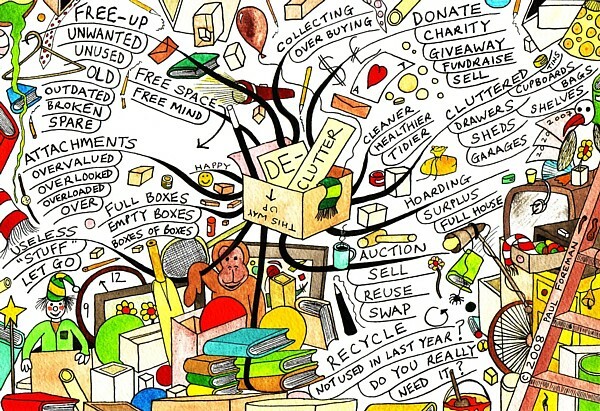 The reason we buy something new, want it is what keeps money flowing out and stuff flowing in.But how does its journey proceed from wanted/needed item to stuff to clutter. Take for example my efforts with breadmaking. First I used to buy all bread at the supermarket with its wrapping, unhealthy ingredients etc. Then I decided to get a bread-maker and with a family of five found that one was not enough really I needed two. I then became concerned about the sugar,salt ,wheat content of the bread machine bread and the resources used. Indeed the bread had no wrapper and had not travelled halfway through the country from depot to depot but it did use electricity and for the convenience of that wondeful feel good smell it mainly took up a lot of space. Not ot mention the bags of flour varieties. If decluttering was a once off activity then we would all have simpler homes but as we grow our knowledge and interests, things become stuff and then clutter. The mystery about clutter is that once clutter was a longed for, searched for, loved item and sentimental reasons can stop us from separating from the belonging. One answer is to commit it to the digital invisible cloud. Take a picture of it and have a special folder on your computer. Particularly useful for that achievement certificate in grade 5 or family photographs. But mainly ask the question" Why do I feel the need to hang on to this item? Those answers might surprise you and then you might be able at a click of a mouse to make it disappear like magic. Really advanced decluttering needs a discipline of bringing one item in and one item out but that could sound too scary right now. Winter time gives us less vegetables to choose from and although outside my salad patch contains lambs lettuce and a few hardy varieties it is not as prolific as summertime. The addition of sprouted seeds adds a lovely crunch and vitality to salads,sandwiches and stir-fried vegetables. The process is simple but it requires daily attention and the equipment needed can be simple or complex but lets start simply. For a visual representation this video provides a good introduction to sprouting. 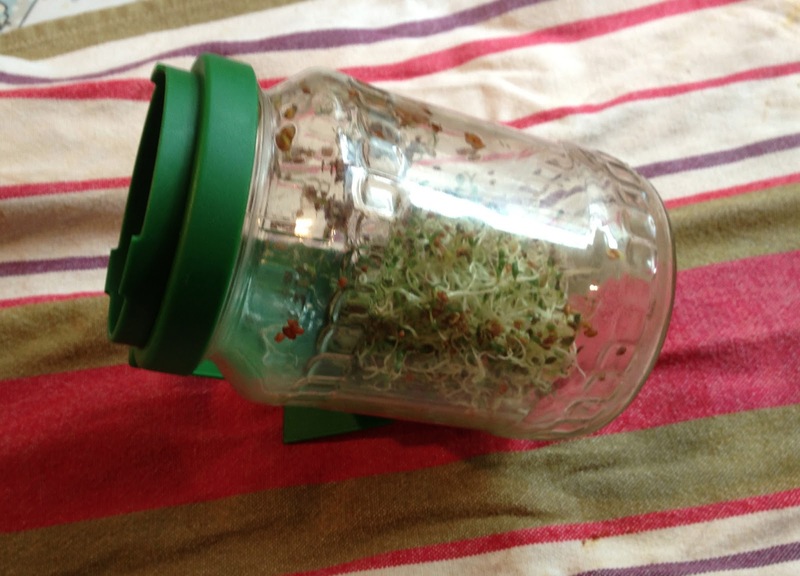 My little jar was a present from a neighbour but it works well and delivers a small amount of sprouts to try the principle out. Little sprout jars and seeds can be obtained in the UK from https://www.livingfood.co.uk. When your sprouts are ready to eat they will keep in the fridge for about 3 days thus a continuous small supply can be achieved with 2 jars on a windowsill. Sprouts contain all the energy a seed would have needed to blossom and eating sprouts gives us the opportunity to harness all that goodness. Sprouted seeds can be bought at a wholefood store in bags ready made but growing your own is much more economical. Why not try it as an addition to your salad supply. Sprouting makes indoor gardening a reality providing valuable nutrients when we most need it. Came across a valuable tool on Colletterie's blog offering a free spreadsheet to enable you to make an inventory of your wardrobe and what it is you need and may need to replace I visit Colletterie blog regularly as the patterns she offers for items of clothing are classic vintage but it also has some useful tutorials should you wish to make your own clothes. can I support a local enterprise? In 2013 I am making an extra effort to buy British, meaning local within the British Isles not because I am patriotic but by doing so the miles the item has to travel to get to us are reduced and that is an important consideration in our buying criteria this year. Here is a showcase of a small company making leather handbags. Hanson of London Their philosophy is simple and they are reviving a skill that may have been lost to us forever. What do you consider when purchasing an item apart from the pricetag? The price of this handbag is very high but reflects the craftsman's skills and the time it takes to make an individual item. Definitely the price is a barrier. Something to aspire to. Yes its expensive but durable and not guided by simply fashion. It would be hard to justify this item if you had it for just a season or on a whim, but if your aim is to have nothing but useful or beautiful items in your home then its worth the dream. 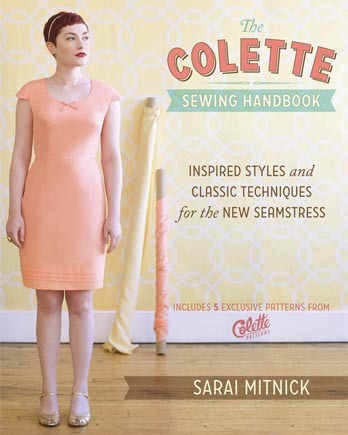 I could see what is available in secondhand shops instead of buying new and then dye it but in pursuit of the make and mend movement and to enhance my skill levels I am considering making them myself. Over the years I have found that making your own garments creates an attachment and appreciation for the resources used in producing the item and an appreciation of the quality of materials used. Apart from that I enjoy making things that are individual and am steering away from the mass produced look. Colours are personal and I have a black base of mix and match items to which colourful items are added as and when. In time I have come to appreciate that there are four seasons and that each season has its own focused activity. Winter is to hibernate and prepare for spring, spring is all about starting the garden, summer about enjoying sunshine, the garden and the long available daylight hours and autumn is about harvesting, preserving and slowing down to winter. I have 3 months of winter left after which the gardening season will kick in so there is no time to lose. 3 months and 3 projects. Let's see if I can pull this off and how I get on. You may have wondered what has happened to the downshifting path to simplicity blog and in 2012 it got hacked into and I thought I had lost the information forever. Then a stroke reduced my ability to function and all my energy refocussed on regaining my health. 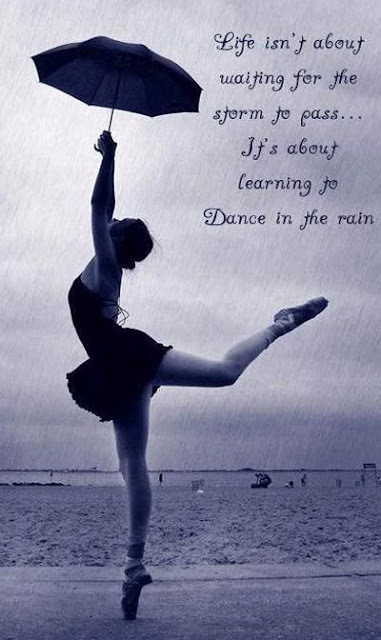 I have learnt to dance in the rain and let every day offer its gift to be received with open arms. This year my focus continues for better health and a more wholesome living by creating and incorporating different routines and habits into our daily life that will make a difference and provide inspiration to others. I believe the word I M POSSIBLE to simply mean that every thought and action is possible maybe not completely how you envisaged it. So where do we go from here? Forwards step by step. Are you with me?